A Warwick medical student has presented her mental health research in Parliament. Third year Ciara Doyle was invited by Warwick to take part in the annual ‘Posters in Parliament’ event, where students from universities across the country present their work for MPs and other officials to see and discuss. 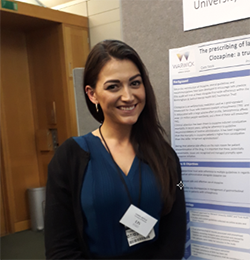 In her poster, Ciara presented the work she had done for her Student Selected Component (SSC) module last year, which found that NHS multidisciplinary teams need more support in optimising certain mental health treatment options. Ciara says: "It was a fantastic opportunity to be invited to Parliament to present the results of my SSC audit last month. While there I was able to discuss the importance of guideline adherence in regard to administration of mental health medication and how the multidisciplinary team can be used to maximise compliance and safe practice. It was great practice to present my research, especially to a non-medical audience, and it was really encouraging to gauge such an interest from other students and government figures alike." Take a look at Ciara's poster here.